Jonathan Schiller ’73 and Nina Shaw ’79 receive the Law School’s highest honor at the annual Winter Luncheon. The founding partners of two eminent law firms were honored by the Columbia Law School community at the 70th annual Winter Luncheon on February 22 at Cipriani 42nd Street in New York City. Gillian Lester, Dean and the Lucy G. Moses Professor of Law, presented the Medal for Excellence to commercial litigator and arbitration lawyer Jonathan D. Schiller CC ’69, LAW ’73 of Boies Schiller Flexner LLP and entertainment lawyer Nina L. Shaw ’79 of Del Shaw Moonves Tanaka Finkelstein & Lezcano. Schiller served as chair of Columbia University’s board of trustees from 2013 to 2018; Shaw is one of the founders of the Time’s Up Legal Defense Fund, which connects those who have experienced sexual misconduct in the workplace with legal and public relations assistance. 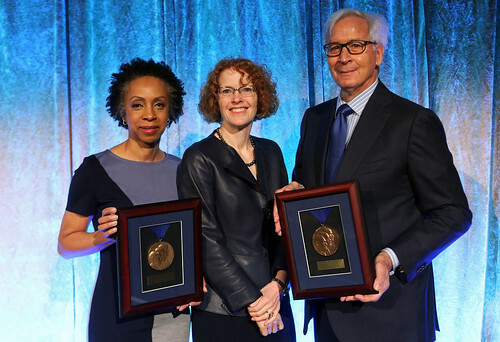 Since 1964, the Medal for Excellence has been awarded to alumni and faculty members who exemplify the qualities of character, intellect, and social and professional responsibility that Columbia Law School seeks to instill in its students. Before 300 alumni, faculty, and friends of the Law School, Dean Lester lauded Schiller and Shaw as leaders who “inspire others by the example of their conduct.” She spoke about the necessity for the next generation of lawyers to develop and hone their leadership skills “to move our society forward” and the Law School’s commitment to teaching leadership as a subject. “When Columbians lead, the world changes for the better,” she said.